My name is Ali and I am pleased that you are visiting our website. We offer at the Red Sea in Dahab (Egypt) horse riding / horse riding excursions (guided tours) through a scenic landscape, off the beaten track - discover Egypt how it really is! We are located close to the hotel Happy life village, which is directly at the beach. You will find us at the right side of the hotel beach. If required, we would be happy to offer you a low-priced pick-up and drop-off. Our Arab horses are very good-natured and also suitable for beginners. I am training horses since many years and will be happy to give you tips and advice. We would also be happy to arrange your individual tour program. 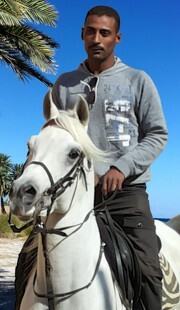 You can also contact us via our email address info@horseriding-dahab.com (English and German).